Do you remember the Automatic car adapters that I’ve reviewed that track your vehicle’s performance and travels? GOFAR is a similar device that’s less expensive and claims to help you save up to 30% on your car’s running costs. GOFAR has an OBD adapter that plugs into the diagnostic port in your car to interface with the onboard computer. A second piece is called the Ray and sits on your dash looking like some sort of alien surveillance device. GOFAR should work with US car models 1996 and newer. 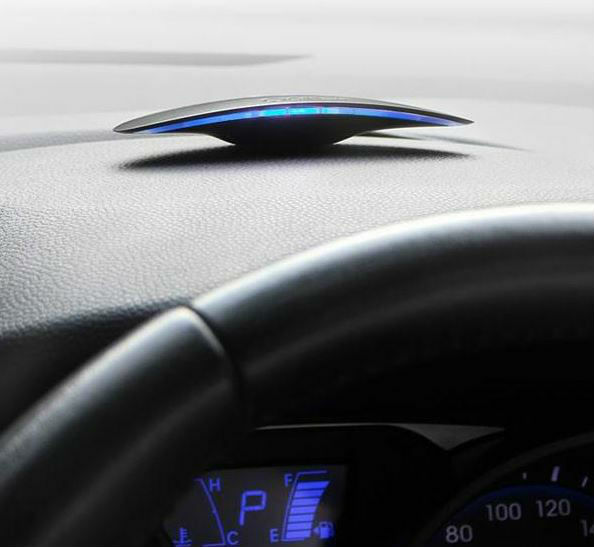 As you drive, the Ray device on the dash glows blue if you’re driving as efficiently as possible, which means no fast accelerating and no hard braking. But if you start driving fast and furious, the Ray will shut that down with a disapproving red stare. The idea is to stay in that sweet (blue) spot because every engine speed has a sweet spot where the engine is maximizing power and minimizes fuel consumption. It’s where your car runs best and uses the least fuel, which translates into you spending less money. GOFAR also interfaces with your smartphone to log and score your driving. You can visit www.gofar.co for more info and you can buy one at The Fowndry for $91 which is a one time cost with no reoccuring fees. Looks like as much fun as the upshift light on cars from the early 80’s.